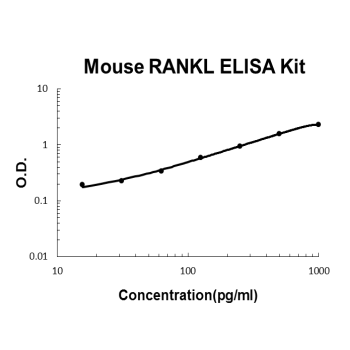 Sandwich High Sensitivity ELISA kit for Quantitative Detection of Mouse TNFSF11/RANKL. 96wells/kit, with removable strips. Highly expressed in thymus and lymph nodes, but not in non-lymphoid tissues and is abundantly expressed in T- cells but not in B-cells. A high level expression is also seen in the trabecular bone and lung. Isoform 1: Cell membrane; Single-pass type II membrane protein. Cytokine that binds to TNFRSF11B/OPG and to TNFRSF11A/RANK. Osteoclast differentiation and activation factor. Augments the ability of dendritic cells to stimulate naive T-cell proliferation. May be an important regulator of interactions between T-cells and dendritic cells and may play a role in the regulation of the T-cell-dependent immune response. May also play an important role in enhanced bone-resorption in humoral hypercalcemia of malignancy. Receptor activator of nuclear factor kappa-B ligand(RANKL), also known as tumor necrosis factor ligand superfamily member 11(TNFSF11), is a protein that in humans is encoded by the TNFSF11 gene. This gene encodes a member of the tumor necrosis factor(TNF) cytokine family which is a ligand for osteoprotegerin and functions as a key factor for osteoclast differentiation and activation. This gene is mapped to chromosome13q14.11. Targeted disruption of the related gene in mice led to severe osteopetrosis and a lack of osteoclasts. The deficient mice exhibited defects in early differentiation of T and B lymphocytes, and failed to form lobulo-alveolar mammary structures during pregnancy. This gene may play an important role in enhanced bone-resorption in humoral hypercalcemia of malignancy. Tang Zn, Zhang F, Tang P, Qi Xw, Jiang J. Biochem Biophys Res Commun. 2011 May 13;408(3):411-6. Doi: 10.1016/J.Bbrc.2011.04.035. Epub 2011 Apr 13. Hypoxia Induces Rank And Rankl Expression By Activating Hif-1?? In Breast Cancer Cells. Xu S, Wang Y, Lu J, Xu J. Rheumatol Int. 2012 Nov;32(11):3397-403. Doi: 10.1007/S00296-011-2175-5. Epub 2011 Nov 6. Osteoprotegerin And Rankl In The Pathogenesis Of Rheumatoid Arthritis-Induced Osteoporosis. Q: Will EK0843 react with human samples? A: EK0843 does not react with human samples.